The United States Hockey League announced the Forward, Defenseman and Goaltender of the Week for Week 19 of the 2018-19 season. 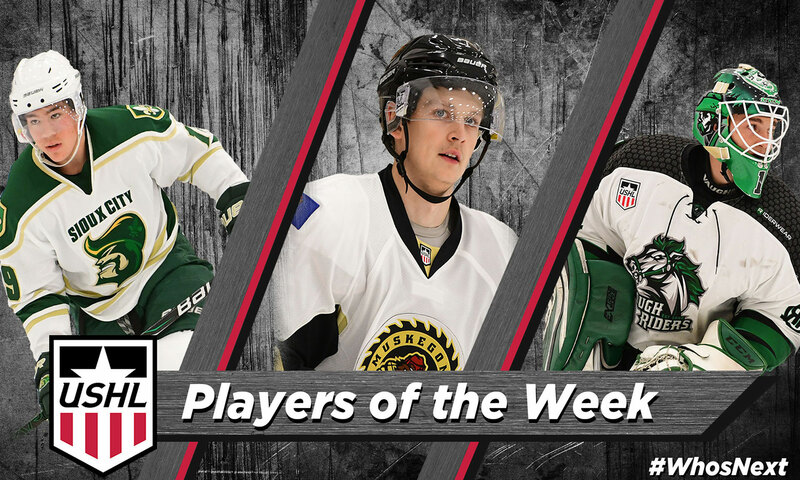 Sioux City Musketeers forward Bobby Brink and Cedar Rapids RoughRiders goaltender Blake Pietila earned their second weekly awards of the year, while Muskegon Lumberjacks blueliner Alex Yakovenko was named USHL Defenseman of the Week for the third time this season. Brink recorded four points in two games over the weekend, including a three-point performance on Saturday, Yakovenko scored twice and dished out a helper on Friday to keep him atop the USHL defensemen scoring race and Pietila recorded a 25-save shutout on Saturday before stopping 22 of 23 shots on Saturday, helping Cedar Rapids move into a tie for third place in the Eastern Conference standings. The USHL is America’s only Tier 1 junior hockey league, and continues to lead the world in the advancement of Division I college hockey athletes. After being out of the lineup since Nov. 24, Brink announced his return to the ice with a bang over the weekend. The University of Denver commit recorded an assist in Sioux City's Friday game against Muskegon before scoring twice and adding his second helper of the weekend on Saturday to help the Musketeers to a 7-4 victory over the Madison Capitols. Despite not having played in a USHL game in 69 days, Brink is still in the top-15 among USHL players in scoring with 37 points (17G, 20A), a total that places him second on Sioux City, only behind Calgary Flames prospect Martin Pospisil. He is currently riding a 12-game point streak, dating back to Oct. 27, with an astounding 24 points (14G, 10A) in that span. The streak is currently the seventh-longest point streak in the USHL this season. 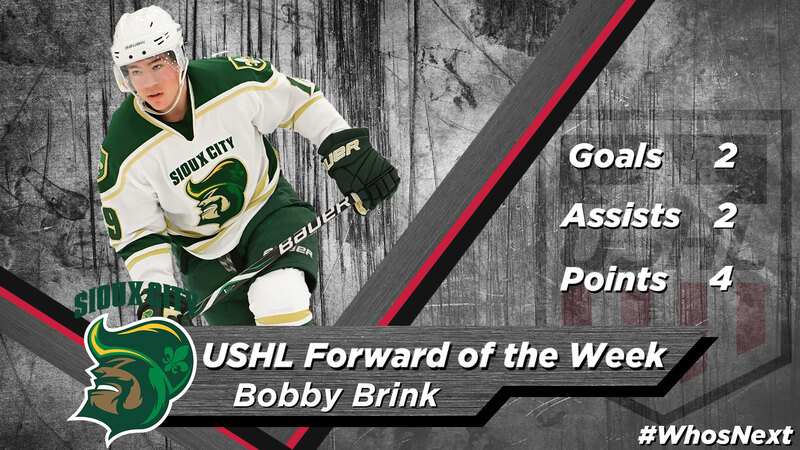 This marks Brink's second weekly award of the year, as he was previously named USHL Forward of the Week on Nov. 5. It has been a breakout season for the Minnetonka, MN native, his first full season in the USHL. He helped Team USA to a gold medal at the 2018 World Junior A Challenge, where he tied for the tournament lead in scoring with eight points (2G, 6A). Most recently, he was ranked 29th among North American skaters in January's NHL Central Scouting Midterm Rankings. He played in 13 games with Sioux City last season, tallying four points (2G, 2A) before playing eight Clark Cup Playoffs games with Team USA, where he recorded a pair of assists. Brink was selected 16th overall by Sioux City in the 2017 USHL Phase I Draft and previously played for Minnetonka High (USHS). In Muskegon's 5-4 victory at Sioux City on Friday, Yakovenko scored two goals and added an assist to help the Lumberjacks to the victory. The Russian blueliner leads all USHL defensemen and is second on the team in scoring with 37 points (15G, 22A) in 37 games. He leads all defensemen in goals, is tied for third in assists and is one of only four blueliners to average at least one point-per-game this season. Yakovenko has five multi-goal games this season, including three in his last eight contests dating back to Jan. 13. 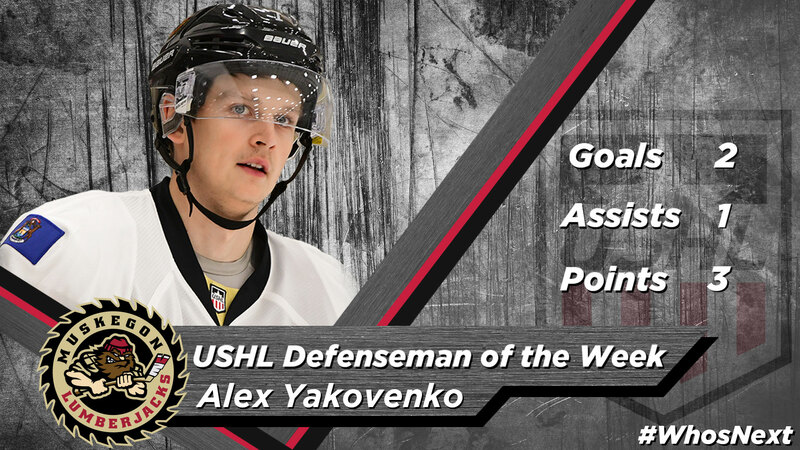 This is Yakovenko's third weekly honor of the season and fourth of his USHL career, as he was named Defenseman of the Week once last season (Apr. 9), a year in which he recorded 17 points (3G, 14A) in 31 games for the Lumberjacks, as well as in back-to-back weeks earlier this year (Nov. 19 and 26). He was added to Muskegon's roster in January 2018 and previously played for Chelmet Chelyabinsk in Russia. Pietila posted a 25-save shutout against the Dubuque Fighting Saints on Friday night before turning 22 of the 23 shots he faced aside on Saturday to help Cedar Rapids knock off the Green Bay Gamblers and move into a tie for third place in the Eastern Conference standings. With his stellar performances over the weekend, the Howell, MI native moved to 15-9-2-1 on the season and has won six of his last eight starts dating back to Jan. 4. He now holds a 2.65 GAA and .908 SV%, placing him seventh and sixth, respectively, among all USHL goaltenders. 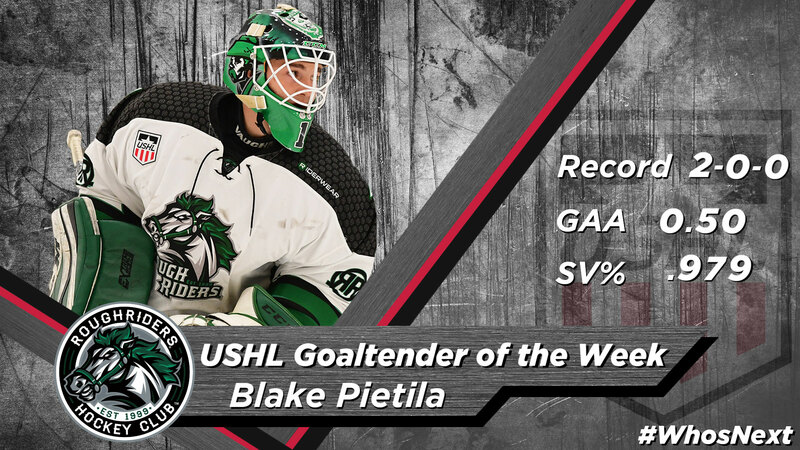 This is Pietila's second weekly award this season, as he was previously named USHL Goaltender of the Week on Oct. 1 following the opening weekend of the 2018-19 season. In addition to this strong USHL play, he helped Team USA to a gold medal at the 2018 World Junior A Challenge, posting a 2.27 GAA and .917 SV% in a three-game span. The Michigan Tech commit played in 32 games with Cedar Rapids a year ago, his first USHL season, finishing with a 3.03 GAA and .903 SV%. Pietila played for Little Caesars and Compuware prior to his time in the USHL.